They are practically perfect in every way. Could these two be any cuter? Emily Blunt and John Krasinski were adorable together at the premiere of “Mary Poppins Returns” in Los Angeles on Thursday night. The married couple held hands and exchanged plenty of smiles and private whispers as they walked the red carpet. Seriously — could they be more perfect together? Blunt looked stunning in a white, flowing Yanina Couture gown with puffed sleeves, a gathered waist and a deep V-neckline. Her husband also cut a dapper figure in a wine-colored suit with a blue and burgundy patterned shirt underneath. 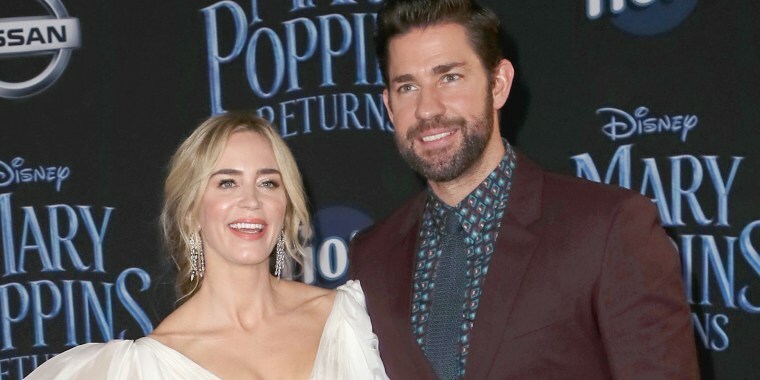 Hopefully Krasinski brought some tissues with him to the premiere; the former "Office" actor recently told Ellen DeGeneres he was brought to tears seeing his wife as the title character in “Mary Poppins Returns" for the first time. “They started screening the movie and 25 minutes into the movie, I stood up and went to the back of the room, and Emily said, ‘Do you not like it? I’ve never seen this happen,’” Krasinski said. He went on to say he was actually trying to find a tissue because watching Blunt in the sequel to the iconic Disney movie made him so emotional. Blunt later told Entertainment Tonight that she thought her husband's tears were sweet: "I love that, when guys cry. I think it’s a beautiful thing, (when they’re) not so tough." The pair married in 2010 after dating for about two years. The chemistry was pretty much immediate when they first met, Blunt told Willie Geist in April on Sunday TODAY. And after eight years of marriage, it’s obvious they are still head over heels in love.